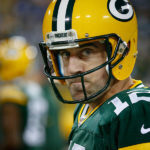 Photos From The Green Bay Packers vs Arizona Cardinals 2011 NFL Football Game. The NFL football season is under way. 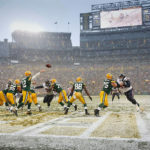 Here are a few of my favorite photos from the Green Bay Packers first home preseason game of the 2011 season at Lambeau Field. 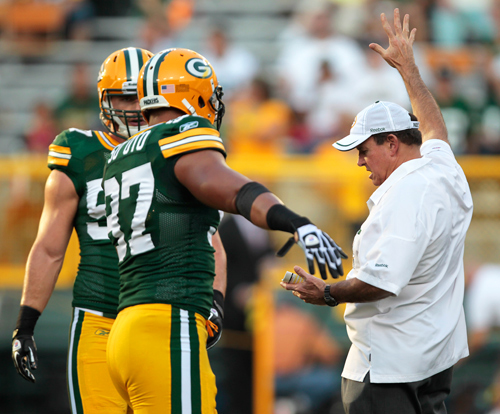 The Packers defeated the Arizona Cardinals 28-20. 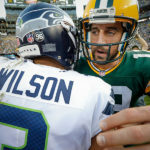 The Packers won the Super Bowl last year, so expectations are high for this year’s team. 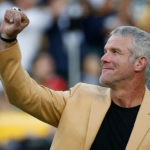 Check back throughout season as I blog about my favorite photos from each home game. Preseason games can be a little boring to watch and a little boring for a sports photographer. Before the game started, I looked for some features as I entered the stadium and was happy with a couple that I found. The vibe outside of Lambeau wasn’t as electric as it can be before a regular season game. I did find one of my favorite features as I headed to our work area: a photo of a vendor wearing a Rodgers jersey, just taking in the empty stadium. As for action photos, it was a little meek. The starters only played a few series and then it was musical chairs of young players trying to make the team. 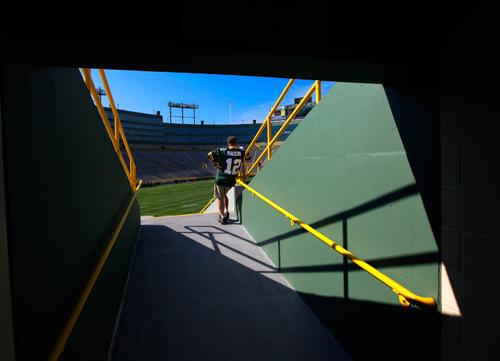 Wearing his Aaron Rodgers jersey vendor Bret Valentine looks out on to an empty Lambeau Field before the game. 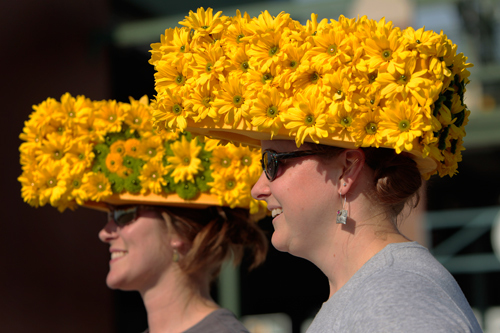 Green Bay Packers fans Nicole Campbell and Barbie Gossen show off their fresh flower cheese heads. 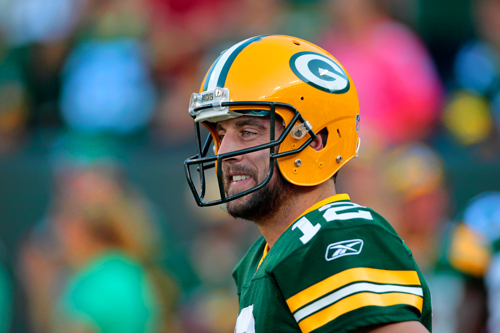 Green Bay Packers quarterback Aaron Rodgers before kick off. Green Bay Packers defensive coordinator Dom Capers during warm ups. Green Bay Packers center Scott Wells. Green Bay Packers quarterback Graham Harrell. 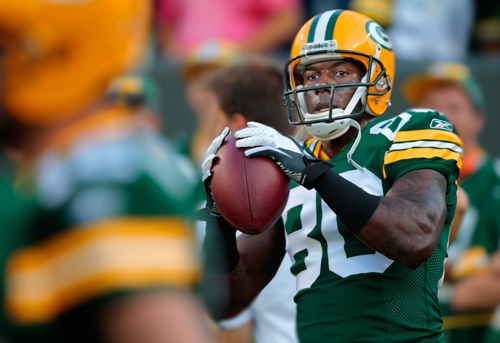 Green Bay Packers tight end Jermichael Finley. Green Bay Packers safety Nick Collins. Green Bay Packers cornerback Charles Woodson. Green Bay Packers wide receiver Greg Jennings and linebacker A.J. Hawk shake hands with former Packers offensive lineman Arizona Cardinals guard Daryn Colledge before the coin flip. Green Bay Packers wide receiver Donald Driver gets a first down as Arizona Cardinals cornerback Richard Marshall and safety Kerry Rhodes defend. Arizona Cardinals running back Beanie Wells gets takedn down by Green Bay Packers linebacker Frank Zombo, safety Nick Collins and safety Morgan Burnett. Green Bay Packers wide receiver Greg Jennings does a Lambeau leap after scoring a touchdown. Green Bay Packers quarterback Aaron Rodgers runs for a first down as Arizona Cardinals linebacker Daryl Washington and defensive end Calais Campbell defend. Arizona Cardinals quarterback Kevin Kolb gets sacked by Green Bay Packers safety Nick Collins. Arizona Cardinals running back Beanie Wells gets tripped up by Green Bay Packers safety Nick Collins. Green Bay Packers cornerback Jarrett Bush defends as Arizona Cardinals wide receiver Larry Fitzgerald reaches for a pass. Arizona Cardinals quarterback Kevin Kolb gets a pass over under the defensive pressure of Green Bay Packers defensive end Jarius Wynn. Arizona Cardinals running back Beanie Wells gets taken down by Green Bay Packers linebacker Frank Zombo and cornerback Josh Gordy. 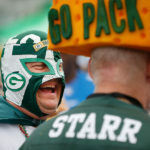 « 2011 Green Bay Packers Family Night Scrimmage.